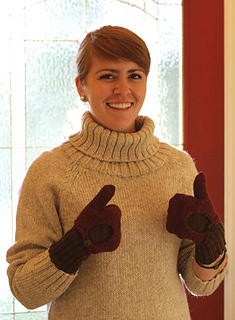 18-Nov-09: I have added another pdf to the download for this pattern, giving instructions for also making gloves, fingerless gloves, and fingerless mitts to replace the Inner Mitten. 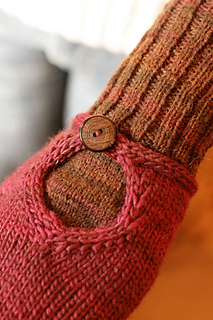 All of these options are worked using the same cuff instructions from the original pattern, as well as the same gauge and yarn specifications. The add-on pdf is meant to be used in conjunction with the original pdf. Dimorphous means “having two forms”. This pattern blends form and function perfectly. 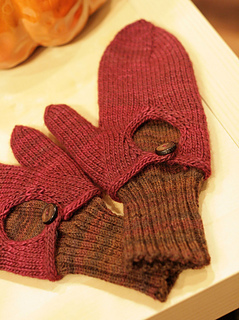 These versatile mittens will give you the option of warmth from the first leaf of fall to the last snow and everything in between. 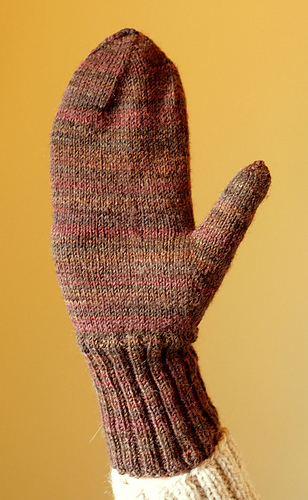 The simple Inner Mitten is worked in the round with a thumb gusset and a slim-fitting hand in sock weight yarn, while the Outer Mitten is worked in a drapey, luscious, DK weight yarn. 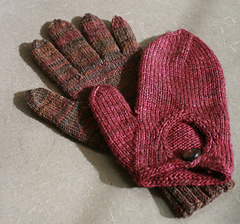 This pattern is sized to fit a 7.5” hand (measured around the palm) with about .5” of negative ease. 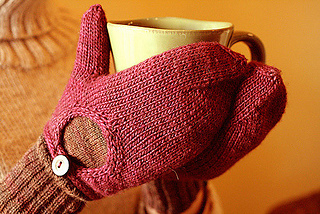 This allows for a comfortable and secure fit. 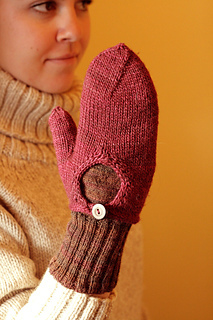 The bottom portion of the Outer Mitten is worked flat until the keyhole is finished, and then the rest of the mitten is worked in the round. All other portions of the pattern are worked in the round.